Lance Mindheim has written a terrific post called The Hidden Blessing of Constraints. I wish everybody in the hobby would read it, and heed it. Select a prototype to model: Learning to model what is there will force you to challenge your abilities in a way that freelancing might not, because when freelancing it’s always possible to adapt one’s vision to one’s skills or available product. 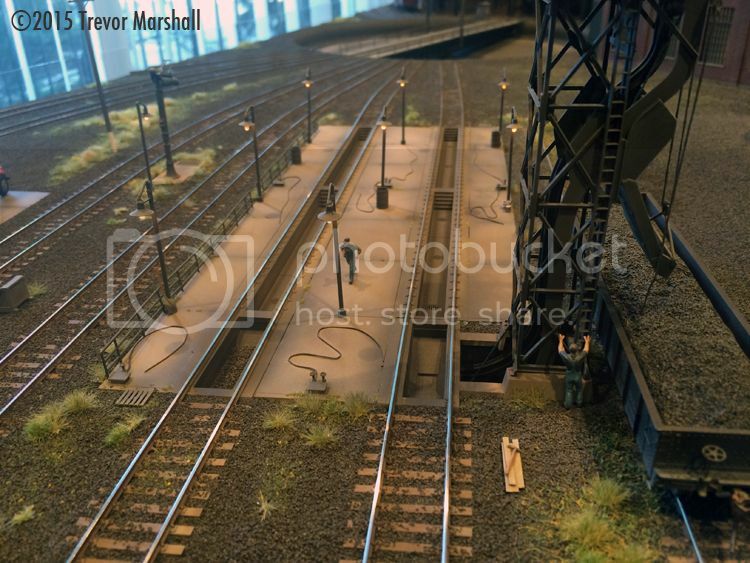 Pick a manageable piece of railway to build, so that as you tackle the various skills required you see real progress on your layout. 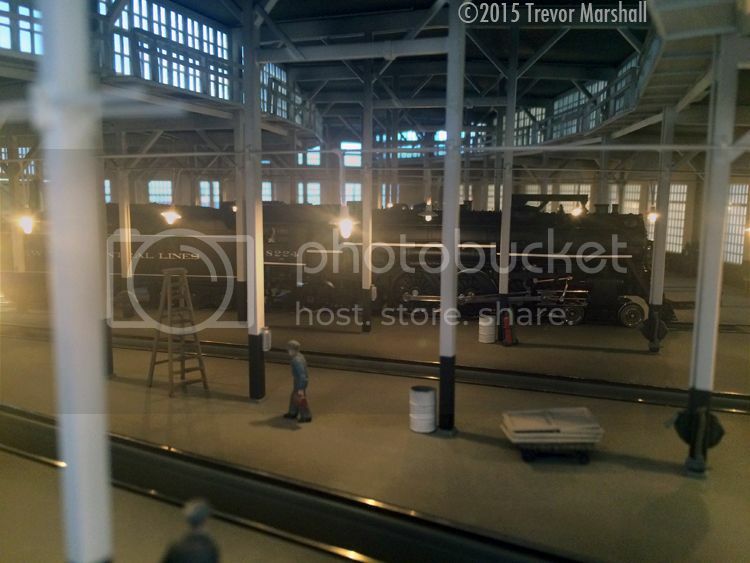 Earlier this month my friend Mark Zagrodney and I visited Buffalo, New York – in the 1940s, thanks to Rick De Candido and his wonderful HO scale interpretation of a New York Central engine terminal that almost was. Our operating session required three people. Rick worked as the road crews: He delivered locomotives from the rest of the world (staging area) to the first inspection stop, and collected outgoing locomotives from the ready track. Mark and I were hostlers. Mark handled locomotives up to the turntable, while I managed the turntable and roundhouse work. 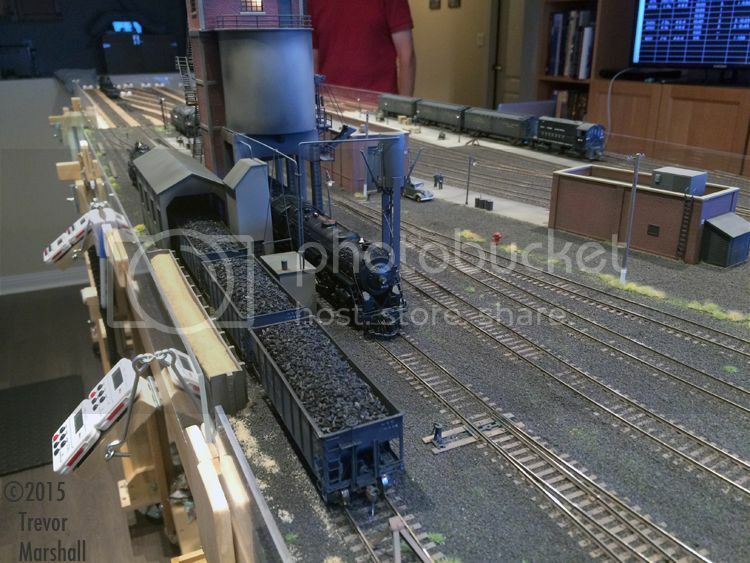 The lower staging includes a manual turntable for spinning locomotives. 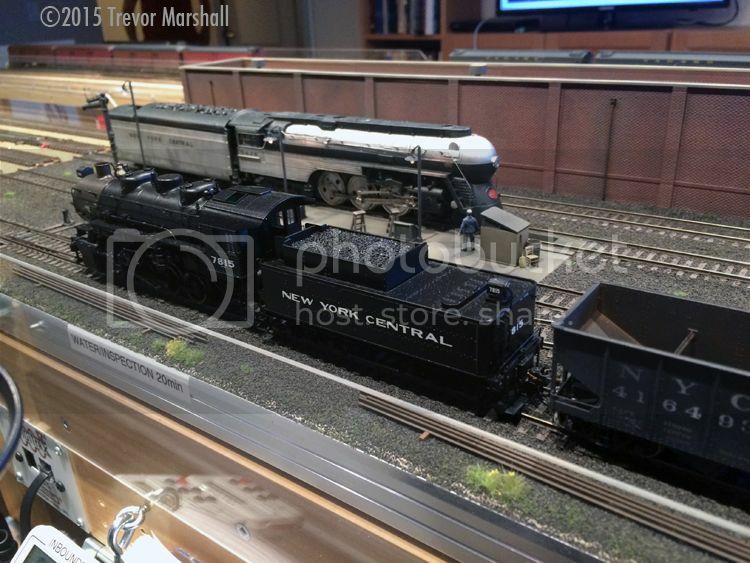 The upper deck is used for supply trains – for example, a switcher with a cut of loaded hopper cars for the coaling tower. 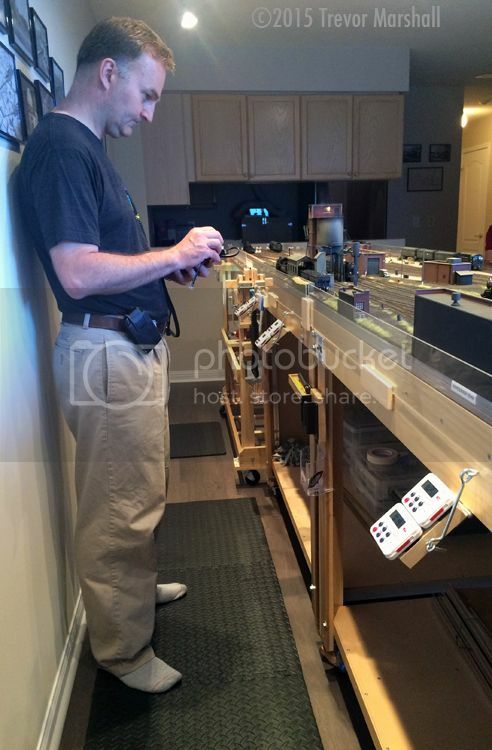 (Rick plans to swap the order of the decks at some point, since the engine level is used more often and he feels it would be nicer to leave the elevator in the “down” position as much as possible.) 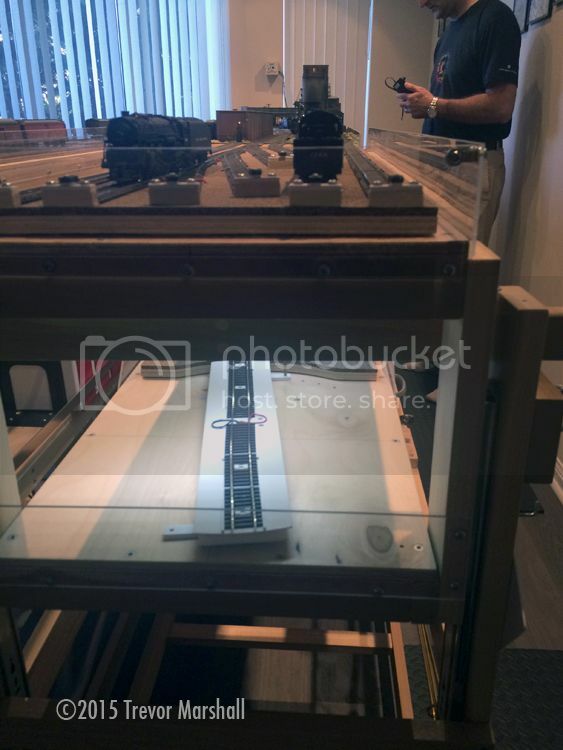 Each deck is a traverser table mounted on drawer slides to conserve space. Also shown in the photo above are two pairs of digital timers. These have pre-set times loaded into them, and represent the time required to perform various functions as a locomotive travels through the terminal. They’re paired because there are two inbound tracks, so each track has its own timer at each work position. When Mark or I spotted a locomotive at a work position, we’d hit start on the appropriate timer and that locomotive would be considered under “blue flag” protection until the timer dinged. We could then advance the locomotive to the next stage of its servicing. Departing locomotives are turned on the turntable then staged on two outbound tracks. Here, they receive a top-up of water and are turned over to the road crew. 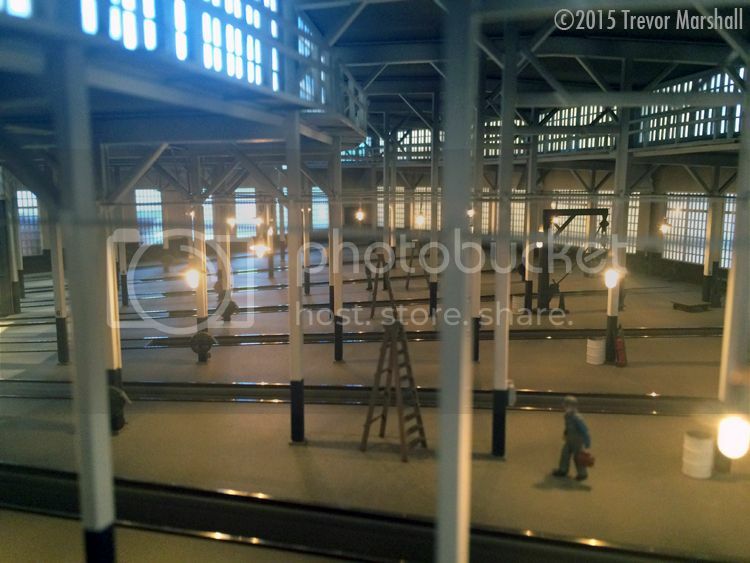 This segment of the layout is also fed by a traverser table-style staging area. Work here is not as tightly scripted as the engine terminal assignments, so it’s an opportunity to spot a car or two before getting back to the main work of the session. 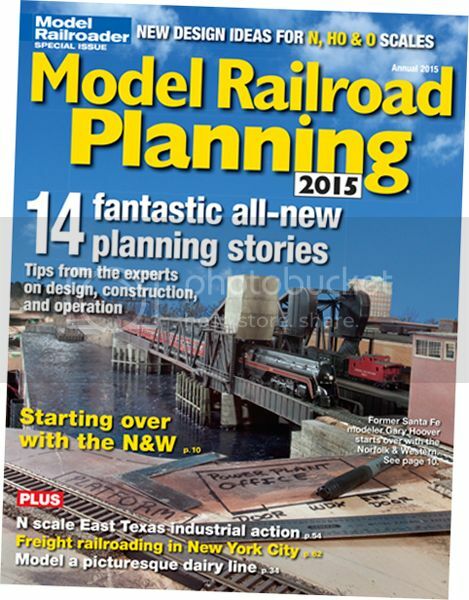 Rick’s layout is a terrific example of thinking creatively to design an achievable layout. 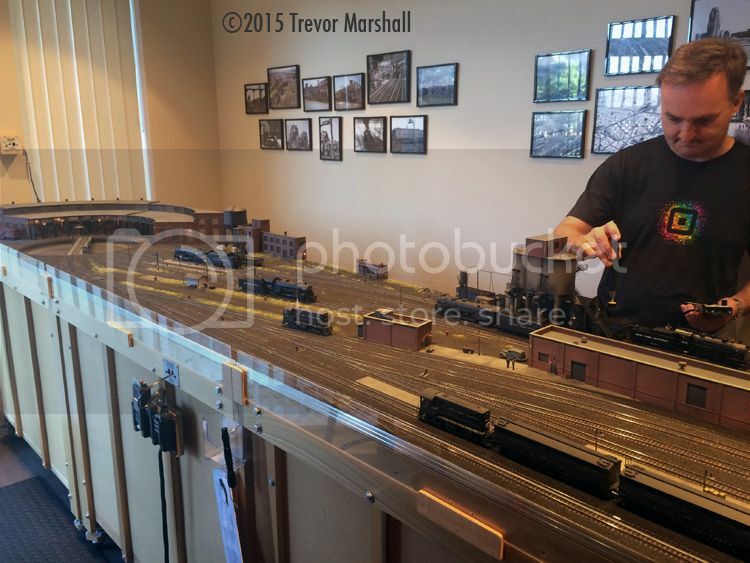 Many of us, faced with the challenge of a modest space in a living room, would gravitate to a modest branch line terminal (like Port Rowan on my layout), an industrial switching area (like the East 38th Street project by Lance Mindheim) or even a single large industry, like the Pine Street Mill. Thanks, Rick, for a great day in Buffalo. I look forward to the next operating session!